Bellaire United Methodist Church & Evelyn’s Park co-host a celebration of our animal friends. 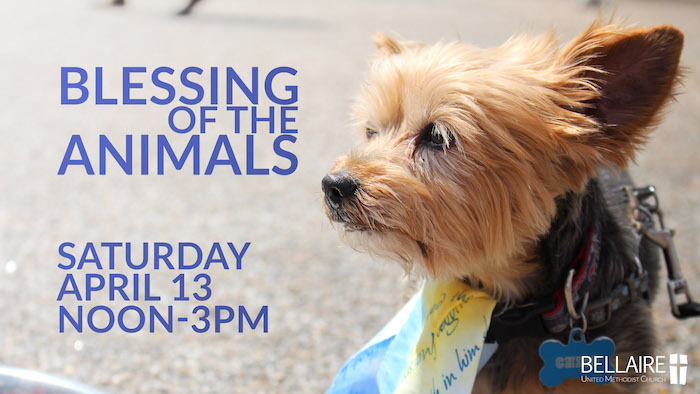 Bellaire United Methodist Church (Bellaire UMC) and Evelyn’s Park in the town of Bellaire, Texas are teaming up to host a celebration of our pet companions and all God’s creatures this Saturday, April 13 from noon to 3:00 p.m. The church and the city park are located at the corner of Bellaire Boulevard and Newcastle, so the event promises to be a big block party for the local pet-loving community. And the event is free! On the south side of Bellaire Boulevard, Bellaire UMC will invite the public and people of all faiths to bring their pets to the church’s front lawn for the ninth annual “Blessing of the Animals.” The service will begin with an opening prayer, homily and a group blessing by the pastors. Afterward, attendees’ pets can receive an individual blessing from Pastors Seann Duffin, Jim Love, Ben West, Diane McGehee, Robert Besser or Trey Burns; and the first 250 participants will receive a free professional photograph of their pet’s individual blessing, courtesy of Nikky LaWell Photography. Nine pet rescue organizations will also bring some of their adorable, adoptable animals to the church in hopes of finding them new forever homes. Across the street, Evelyn’s Park will be hosting its own celebration of the animal kingdom, called “Evelyn’s Bark.” During this event, the community is allowed to bring their personal pets to the park to sniff and mingle with other furry friends while they visit with a variety of pet experts and service organizations including Faithful Paws, aniMeals on Wheels, Rescue Bank, Natural Pawz, Rover Oaks Pet Resort, Southeastern Guide Dogs, Meadowlake Pet Resort, Woof Gang Bakery, and more. Please remember that all pets should be friendly and either on a leash (dogs), in protective carriers (cats), cages (birds, small mammals), fish bowls, or terrariums (amphibians, reptiles). For more information, contact Pastor Sean Duffin at (713) 666-2167 or Patricia King-Ritter at 281-946-9372. View the event on the church’s website at www.bellaireumc.org/bota or the Evelyn’s Park website at www.evelynspark.org or on BellaireConnect HERE.